The centenary of the revolutions in Central and Eastern Europe in 1918-19 has seen the publication of a number of new volumes, mostly single-authored and mostly focused on one country (usually Germany, to a lesser extent Imperial Austria, Hungary or Switzerland). Exhibitions have also been staged in various towns and cities in Central Europe, notably in Zurich, Kiel, and Frankfurt-am-Main. However, women rarely make much of an appearance in this new scholarship and commemorative activity. Where they are mentioned, they usually come into view as “honorary men“ (as in the case of Rosa Luxemburg) or as (passive) beneficiaries of the granting of female suffrage by revolutionary, male-led governments, and rarely as actors in their own right. The revolution, in other words, has been gendered ‘male’, sometimes explicitly, sometimes implicitly – by leaving women out. My paper will present some of the initial findings of a new project launched by myself with Ingrid Sharp of the University of Leeds and an international team of scholars which aims to write women back into the revolution through producing a volume of comparative, thematic essays. In particular, I will set out the five key areas that we intend to investigate, with particular emphasis on the first two and the last one: Women’s Protests, Strikes and Anti-Militarism, 1914-18; Women and Revolutionary Violence, 1918-21; Suffrage, Democracy and Citizenship in the Aftermath of War; Women’s Life trajectories following the Central European Revolutions; and finally, the recent/on-going centenary commemorations of the Central European Revolutions. Matthew Stibbe is Professor of Modern European History at Sheffield Hallam University, UK, and a specialist in twentieth-century Germany and Austria. 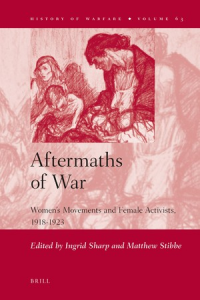 He has published three co-edited books with Ingrid Sharp (University of Leeds) on themes connected with this workshop: Aftermaths of War: Women’s Movements and Female Activists, 1918-1923 (Leiden: Brill, 2011); Women Activists Between War and Peace: Europe, 1918-1923 (London: Bloomsbury Academic, 2017); and Women’s International Activism during the Inter-War Period, 1919-1939 (London and New York: Routledge, 2018). 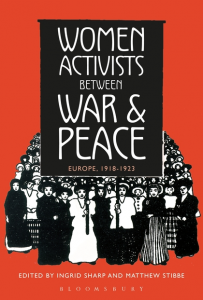 He is currently working with Ingrid and a team of international scholars on a new project on women and socialist revolution during World War I and the immediate post-war period. Their first joint publication in this area has already appeared: “In diesen Tagen kamen wir nicht von der Straße…”: Frauen in der deutschen Revolution von 1918/19, Ariadne: Forum für Frauen- und Geschlechtergeschichte, 73-74 (July 2018), pp. 32-9.